Address: HU-1203 Budapest, Vizisport u. 12. It isn’t necessary to leave the city to escape the smog and enjoy a breath of fresh air. The fairytale-like water world set only 5 kms from the city centre is, for the most part, a nature preserved location. The Ráckevei-Soroksári Danube arm starts from the Kvassay-zsilip at Csepel and is considered one of Hungary’s most beautiful canal networks. The local boatmen’s Mecca is, next to its convenient geographical features, a favoured fishing haven. The jewel of the Little Danube, the Duna Garden Hotel, was built in the summer of 2011 and is situated right on the Danube riverbank, at the foot of the Gubácsi Bridge. The special atmosphere of the elegant building complex is not only due to its’fine lines’, but to the old boat houses. The complex welcomes its guests with 21 rooms, an exquisite restaurant, a special atmosphere Grill Terrace and the city’s individual Yacht harbor with the capacity to accommodate 19 guests at a time. Our environment-friendly hotel is installed with geothermal heating. Each of our 21 rooms is equipped with a mini bar and internet (free wifi) access. Furthermore, our hotel’s luxury suites, overlooking the Danube, await our more ’spoiled’ guests with round tubs and saunas. The hotel’s own Yacht harbor, situated directly on the hotel’s waterfront, awaits the boatmen with various sized docks. The docks are built with a special technique securing calm water for small, medium and large sized boats. Yachts have access to water, power and cable plugs. 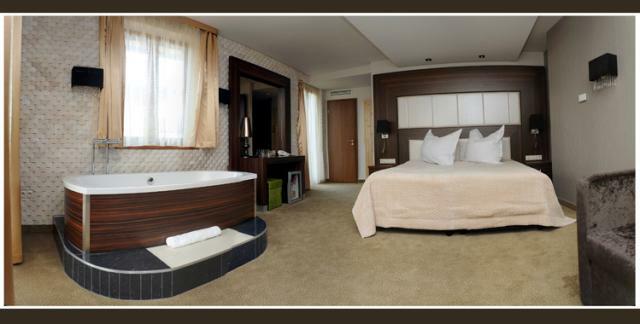 Combining your senses in intimate luxury; The Danube riverbank deluxe. Unlike the restaurants that can be found on the riverside promenade of the Danube, we offer our guests not only traditional Hungarian meals, but special seafood delights and high quality steaks, exclusively imported from the US. Our ’á la carte’ restaurant, overlooking the Danube, enhances culinary pleasure with its wide variety of quality wine. The Grill terrace and open kitchen allow our guests to experience the unique feeling of dinning at a riverbank restaurant. The perfect event venue and individual services are an important part of the success of an event. Whether it is a firm party, a weekend training course, a birthday dinner or an elegant wedding, the atmosphere and magic mood of the Duna Garden Hotel, as well as the professionalism of its staff, guarantees the high success of all events. The 200 seating place, dividable restaurant, the 100 seating place terrace, the grill garden and the VIP conference hall and cigar room provide our guests with special, individual pleasures. Conference room: the restaurant area can be converted into conference rooms with the help of sliding doors. The maximum seating capacity is 100 people. VIP meeting room: a separate, secured room supplied with antique furniture and a magnificent panorama with a maximum seating capacity of 10 people. Cigar room: an elegant atmosphere room exclusively furnished with comfortable leather chairs with a direct view to the Danube.